UnJPEG is a professional, effective and user-friendly application, specially designed to help graphic designer's studios/publishing houses to recover images damaged by JPEG compression. If you are familiar with the consequences of JPEG compression, you will certainly appreciate this powerful and versatile tool. 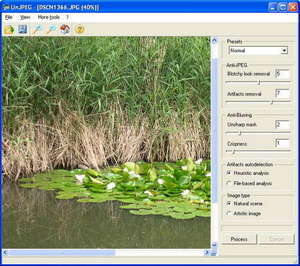 JPEG is the default format used by graphic editors, as well as the format for many digital cameras to save their images. JPEG compression does not save all of the information contained in an image so, when not set to a 100% quality in order to save disk space, it damages the quality of the image by disturbing its size and giving it a slightly dithered effect. UnJpeg 1.5 is a shareware program and can be used as a demo to try the software until the free trial period has ended. A full version of the program is available after the trial period ends. For security reasons, you should also check out the UnJpeg download at LO4D.com which includes virus and malware tests. Additional screenshots of this application download may be available, too.